Jacob Cerf was an impoverished, religious Jewish peddler in 18th Century Paris. Circumstance led him away from his family and faith and into a world of impious debauchery. 300 years later, he’s back, but now he’s a fly in 21st Century New York and involved in the lives of two people. One of them is Masha – an innocent girl, sheltered from the world by her orthodox Jewish family. The other is model citizen, husband and father, Leslie Senzatimore. As Jacob curses his new fate, he decides to repay his maker by bringing these two together putting their goodness to test. This is Jacob’s Folly by Rebecca Miller. With this book, author Rebecca Miller has taken the literary “a fly on the wall” point of view to a new level, making the narrator of the story into that fly, literally. Initially this is why I had some doubts about this novel. Whenever I come across this type of mechanic in a book, I recall something author John Irving wrote about an incident in one of his creative writing classes. One student wrote a story about a meal from the viewpoint of a spoon. Most of the class thought it was clever. Only Irving and one other student disagreed. Their argument was this wasn’t believable because we are not spoons. Well, we also aren’t flies. However, the more I read, the more I came to accept this seeming affectation as almost natural, and why not? Even adult literary fiction employs magical realism, these days. Joanne Harris is a case in point. So however ridiculous this may sound, this conceit actually works in spite of everything; but, not exactly as you might expect. But if we are asked to suspend disbelief, it must be for a good reason, and it must be artfully done. In both of these, Miller has done her job well. The good reason for having a 300 year old Jacob living in this world as a fly, allows Miller to recount his human life through his flashbacks. Juxtaposing this with Masha and Leslie also draws parallels and highlights the differences between these three people. Jacob started out as a virtuous and devout man, and at the outset, both Masha and Leslie could easily be called righteous. Both misfortune and temptation led to Jacob’s downfall. This makes Jacob set these two up with the circumstances that lure them away from morality and faith. In fact, boiled down to the common denominator, Miller is dealing with the subjects of God vs. Satan, virtue vs. vise and devotion vs. desecration. But as heavy as this may sound, this book has actually been written with quite a light touch. Using language that hovers somewhere between the lyrical and the ordinary, Miller takes us on two journeys. We flit between Jacob’s life and his attempts to influence the lives of Masha and Leslie. On its own, the Jacob’s life story could easily have stood on its own. However, the tales of Masha and Leslie could not have been successfully united without the inclusion of Jacob. To do this, Miller needed to bring in the concept of reincarnation, or more specifically, the Jewish Kabbalistic concept of “gilgul neshamot” – the transmigration of souls. It is important to note that it is often problematic when Judaism comes up in books written by non-Jewish authors. This can be especially true when it comes to something as esoteric as the Kabbalah. Miller, however, overcame this hurdle with immense aplomb, and I could find absolutely no fault with even the tiniest of Jewish aspects. Moreover, nothing included is the least bit overt or gratuitous, lending even more to the flow of the prose. While I’m sure most of the kudos for this goes to her researchers, Miller also deserves no small amount of praise for just attempting this feat. Even more amazing is how she makes both Jacob and Masha into such totally vivid characters. The richness of their Jewish lives is contrasted beautifully with their feelings of being trapped. The guilt they experience when they first break a Jewish law is carefully counterbalanced with the adrenalin rush of doing something forbidden. And then there’s the inner struggle they both have of wanting to remain in that sheltered, comfortable life while at the same time desiring the fearful freedom that lies outside that protective world. Miller also gives Leslie this same philosophical grappling when delving into the true motivations behind heroism. With him, she asks the question, are those who would go so far as to risk their own lives in order to save someone else actually acting altruistically? Isn’t there really a selfish reason hidden beneath their actions? While this is absorbing, Leslie doesn’t feel quite as three-dimensional as Jacob and Masha. Of course, we need to understand Leslie, his life and his family and how he becomes acquainted with Masha. And although those parts of the story are necessary, they feel more mechanical and sketchy than the rest of the book. Because of this, the whole of this book is greater than the sum of its parts. Despite any reservations one might have regarding a fly as both narrator and antagonist of a story – especially one with a human past – this really is a beguiling novel. Miller weaves these stories together like a fine tapestry. The accuracy regarding Jewish orthodoxy and its history enhances the action, and adds an exotic element that carefully contributes to the characters and their development like just the right amount of spice in a gourmet dish. 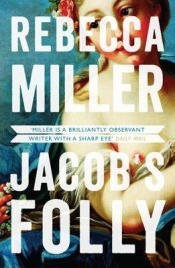 All told, I think Jacob’s Folly by Rebecca Miller deserves a solid four stars out of five and gets my recommendation. Thanks to Canongate for sending a review copy of this novel. No Comments on "Jacob’s Folly"